In "When Buster Met Fatty," my post last week, we learned that Buster Keaton arrived in New York in February of 1917 on his own for the first time. He was 21 years old and looking to up his game. A trained vaudevillian, he'd always performed with his parents; but now he was flying solo. Monday, February 26th is the date (I have surmised) for when Keaton showed up at the office of his agent Max Hart, located near Times Square. Hart set Keaton up with an excellent gig performing with The Passing Show of 1917, which would soon begin its run at the Winter Garden Theater on Broadway. It was a sweet position to snag -- as it paid $250/week and came with the job security of knowing he would be employed for at least the 6 month New York run and probably for the next year if he chose to travel with the show. Keaton was well pleased with this turn of events. The next few days must have been a whirlwind. He'd only just relocated in New York, and needed to secure a place to stay and take care of logistics. He needed to write to his mother and let her know the good news and he needed to think about how to adapt his routines for an act of 1 instead of 3. It was a lot for a young man to be getting on with. The cold, windy weather and the constant news of intensifying international events had to be the counterpoint to what was sure to be an otherwise cheerful outlook on what life was handing him. I imagine it felt a bit like a crossroads as Keaton hung around New York waiting for rehearsals to begin and thinking about life, his career and the impending war. One day, not long after the meeting with Hart -- on Thursday March 8th* [or, in light of new evidence, Thursday March 15th] (I have deduced in the Holmesian sense) -- Keaton was walking down the street thinking about his routine for The Passing Show when he ran smack dab into an old friend, Lou Anger. He'd known Lou from the old vaudeville days and they stopped to chat. Anger was walking (maybe) with another man Keaton knew by reputation only -- a movie star. This was Roscoe "Fatty" Arbuckle, a large presence in every sense of the word in the burgeoning film industry. 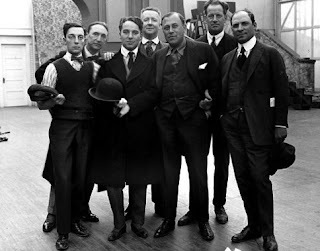 Arbuckle and Anger chatted with Keaton awhile that day, telling him about how Anger had left the world of performing in order to manage a movie studio for Joseph Schenck and how they'd wooed Arbuckle away from Mack Sennett Comedies in order to be the star and director of short comedies for this new endeavor. The film studio (Colony Studios, it was called) was an umbrella for several production teams, including the one Fatty headed known by the crazy, unpronounceable French name "Comique." They delighted Keaton with their stories and of course the conversation wound back around to Buster. Had he ever been on a movie set? they wondered and, would he like to see theirs? The answers were "no" and "why not," and the appointment to go see it was set. The following day (or possibly on Monday depending on which account you believe), Keaton made his way over to Colony Studios to see what all the fuss was about. When he got there a lot of things happened. Arbuckle, knowing Keaton was a clutch comedian, asked him to do a small part in the film he was shooting -- The Butcher Boy. It went extremely well and, by the end of the day, Buster was dying to get inside the film camera, understand the cutting process, the projection room and all of the mechanics. He almost instantly was struck with the enormous potential of this medium and fascinated by it. Fatty, too, was excited about working with Buster and picked away at his reserve. Do another scene? Finish this film with us? Why don't you just stay on with us? Keaton didn't need much arm twisting. He was hooked from the moment he first examined the motion picture camera. Keaton got that first taste of filmmaking, impressed Arbuckle, gained a friend and mentor (even happened to meet his future wife) and began a path of filmmaking genius the likes of which the world would be lucky to ever see again. Soon, I will start blogging about the films this collaboration produced in celebration of the Centennial anniversary of the release of each! But first, I am taking the time to reconstruct the details of that first meeting. I previously reported on my research, analysis, sleuthing (and just plain guess work) that led to the unpicking of the exact dates of these fateful meetings, but now, I want to apply my skills to the question, not of when, but of where Buster Met Fatty. First, there is one preliminary matter to clear up. I am working with the assumption that Buster and Fatty met while they were walking in the street. Two descriptions of the event appear when Keaton recalls and recounts the details in various biographies and interviews. One is that Buster ran into Lou Anger in the street and that Lou invited Buster back to the studio where he met Arbuckle. If you are a subscriber to this first path, then the question seems much more straightforward! And the answer is pretty clear - they met at 318 E 48th Street - a big loft / warehouse type building - on the 3rd floor where Fatty Arbuckle ran his film company. If you instead like the second path, the idea that Buster ran into both Lou and Fatty in the streets of New York, the question is much more difficult to solve and is probably never going to be knowable with pinpoint accuracy. Actually, I don't have a super strong opinion on which of these paths is the right one. I can visualize them both quite nicely, but I would say that the meeting in the street seems to have the weight of the authority in its favor. 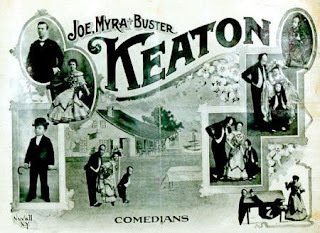 It comes from several accounts: the Keaton Autobiography "My Wonderful World of Slapstick" and numerous interviews [Pratt, 1958; Bishop, Thomas, 1958; Feinstein, 1960; Brownlow, 1964] compared to the meeting at the studio account which comes mainly from Rudi Blesh's biography "Keaton", a book which may have taken a few liberties with the narration of these facts in order to make for a compact and simple story. If they did bump into each other on the streets of New York City, just where did Buster and Fatty meet? There are lots of great signposts on the trail. Arbuckle's film studio is a natural place to start in our investigation. It was located on the 3rd floor of a warehouse building at 318 48th Street. A few details are known about this location, and for that I thank others who have visited and blogged about it. 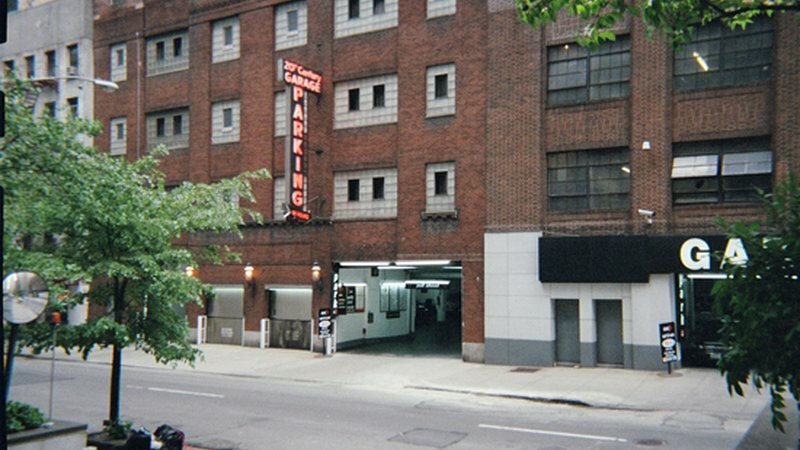 It seems that, as recently as 2012, a portion of the building still existed and housed a parking garage. Unfortunately, fairly recently, the government of Singapore bought the building for $30 million - in order to be near the UN which is just down the street. This warehouse had become primo real estate. Apparently they really gutted it and nothing original remains. In any case, even if Keaton and Arbuckle did not meet here, this place is interesting for any Keaton fan because it is the place they got to know each other and where Keaton got his start in films. And, I think we have to assume that if Keaton and Arbuckle met in the street, such a meeting would've had to have been nearby! First of all, the Blesh account tells us that when they met in the street the studio was "just a few blocks over on 48th." (p. 85). We should also consider that Fatty Arbuckle and Lou Anger both worked at this location. They were out walking together, possibly mid-morning (based on Keaton's account in the Blesh book that he'd sat down to breakfast then was walking around when he bumped into them. The question is how far would men like Anger and Arbuckle have been away from their studio base? I don't know. I can just throw a few more facts out there. Lou Anger died of a heart attack at age 68 in 1946. On the date of bumping into Keaton, he was about 39 years old. From the photo above, he looks like a reasonably strappy guy, but he also looks pretty dapper. Would walking around Manhattan have been his thing? Fatty Arbuckle weighed a purported 260 lbs. Now, I am the first to admit that Fatty was fit. Look at him springing about and dancing in his movies. However, that said, I don't really see him as a big walker. Truth is, I see this pair as being tethered to the film studio by a distance of about a mile radius from their studio. Obviously that is just a wild guess. But I really do think we should try and come up with a plan to keep them close by. 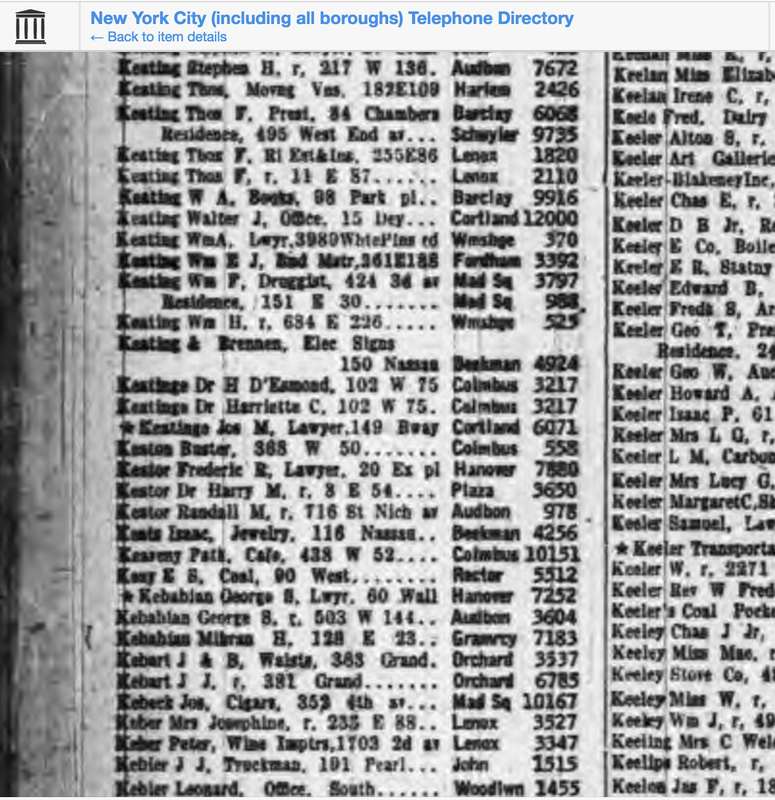 This is super exciting news to report: I found Buster Keaton's New York address, as it appeared in the May 1917 New York phone directory! 368 W. 50th. (So excited about this). I don't know for sure that Keaton was already in this apartment by the date of the meeting, but I think its a good bet. Buster was new to NY when he went to see Max Hart looking for work. From all accounts he meant to stay in NY. Then he got a great job. There would have been no reason to delay and I imagine he would have put time in to finding regular living arrangement and getting out of his hotel right away. My analysis has him spending over a week in town before he met Arbuckle on March 8th/15th. Thus, I think he would have had time to have moved into an apartment by day he met Fatty. 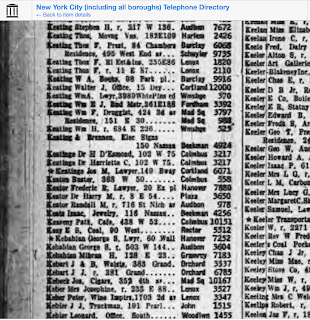 Note that he was living in this same location in the October 1917 phone book, thus, this was obviously a quasi-permanent address for him. Even if he didn't live there yet, the idea that Keaton would have been staying in a hotel somewhere very close by makes a lot of sense too, especially given that the location is perfect! I'll show you in a minute on the map, but just know that this address is within an easy walking distance of his agent Max Hart located at 1564 Broadway, (talk about insanely valuable real estate by the way! ), the Winter Garden Theater where he'd be working, and a hub of stores, food, shows and excitement. Biographer Rudi Blesh describes the day of the meeting with Keaton waking up, going to breakfast at "Childs" then walking around. Blesh tells us that every day it was Keaton's habit to walk past the Winter Garden Theater. All these details are helpful and some can be pinpointed on a map. 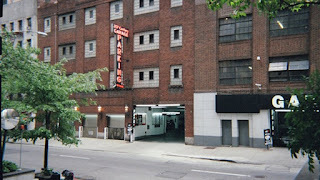 The Winter Garden Theater is located at 1634 Broadway. That's easy anyway. "Childs" is another story. I wasn't expecting to be able to find "Childs" at all (as I'd never heard of it), and instead found way too many Childs'! I was stunned to learn that there are practically dozens of Childs restaurants in New York City in 1917 according to the phone book. I looked for locations of the chain restaurant that were located in the right part of town and one immediately popped out as interesting. It was just a couple blocks from Keaton's apartment and across the street from Max Hart's office and a block down from the Winter Garden. It was located at 1546 Broadway. Although there are about 4 other Childs restaurants that might be in contention in this approximate area of town, it feels like a pretty good bet that the one at 1546 Broadway would have been one Keaton frequented. There are a few things to consider here before we look at a map and put it all together. First, Buster can't be taken too strictly/literally with street locations. For instance he has referred to the film studio's location variously as being between 2nd and 3rd and being between 1st and 2nd. (In fact the later is true). When he says here that he was walking down Broadway "along 8th or someplace," it is hard to make sense of that. Not being a New Yorker, I'm not sure I'm thinking about this right, but from what I can see on the map, there is an 8th Street and an 8th Avenue in Manhattan. Broadway runs at a gentle diagonal in this area from Central Park (around 58th St) to about 14th St where it straightens out. Broadway and 8th Street is an intersection in the Greenwich Village area, and would almost certainly not be where Keaton meant. Broadway near 8th Ave. would almost certainly be what Keaton meant, however, it doesn't really give us a pinpoint location, since the two streets run quasi-parallel for several blocks. 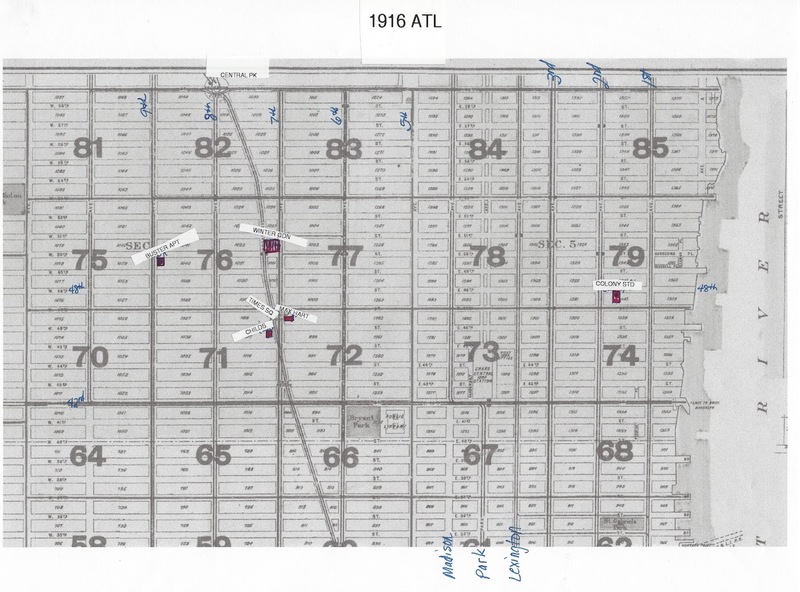 The base map comes from a 1916 Atlas available online. Each of the grids was expandable and I pulled them up to inspect before pinpointing my markers on it. I don't know the exact scale of the map, but can tell you that the distance between Max Hart's office and Colony Studios is exactly 1 mile. You can see that any further north along Broadway (toward Central Park) is going to make the walk back to the studio (for Lou and Fatty) longer than a mile. 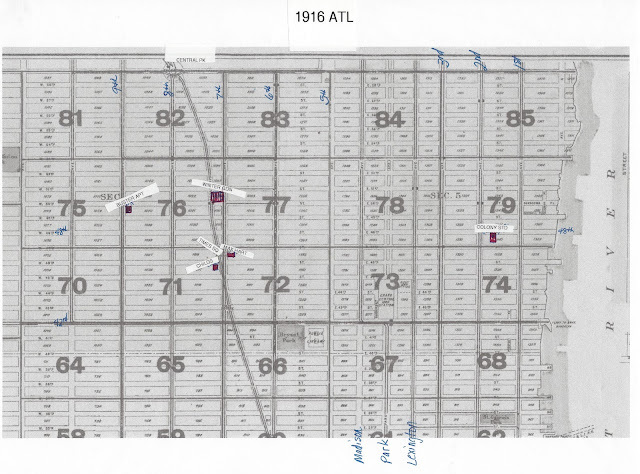 And you can see that the further south you get, the harder it is to say you are "along 8th." Unfortunately, we can also see that it's going to be impossible to both be along Broadway and just a few blocks away from the studio. I think the best we can do is pinpoint the meeting for somewehre along the section of Broadway that slices through grid 76 and grid 71. This area represents the closest that a spot on Broadway gets to Colony Studio -- at about a mile. And, best, it is smack in the middle of the hub of places we've been talking about all along: Times Square, Buster's apartment, Childs' restaurant, the Winter Garden Theater. If it were Buster's habit to wake up, get breakfast at Childs down the street, then walk up, down, in and around Broadway to take in the view of the Winter Garden, he'd be well-positioned to run into Fatty and Lou right in this area and they, in turn, would be reasonably close enough to their place of business to be expected on foot in that area. I think we have a winner! What fun it has been to apply sleuthing and the cold hard glance of logic to these hazy details from the past! I've always been so interested in when and where Buster met Fatty Arbuckle for the first time and taking the time to do this research has made me feel very close to the events. It has also made me feel desperately interested in taking a road trip to New York to see all of these sites. But now its time to let all of this slip back into a soft resting place. 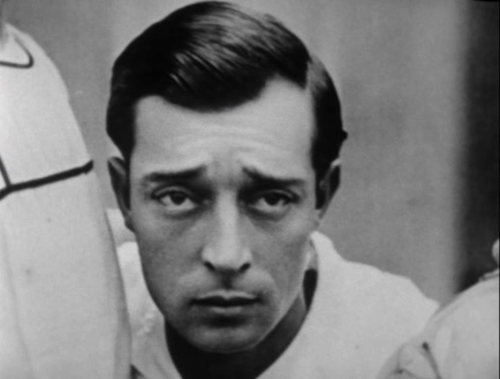 I'll let my mental picture drift happily to the hazy black and white image of a young, confident and street savvy Buster Keaton walking along planning for the future he was on the verge of, then stumbling into a path that changed everything. As a fan I'm so grateful that the story unfolded as it did. So interesting to read, as it paints a clearer picture in one's mind of the time and place they met. Absolutely astounding sleuthing you did there! Great blog you have, BTW. Thank you so much! It is greatly appreciated :) I too, love how doing this has really fleshed out my mental picture of these events.